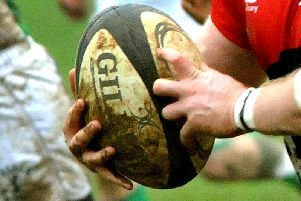 Olney made light work of Leicester Vipers with a 29-7 win on Saturday to remain seventh in Midlands 2 East South. Vipers were penalised again and Olney opted for the line out, 10m from the visitor’s goal line. The home side’s pack won ball and drove for the goal line but were forced into touch giving Vipers a line out on their 5m line. They won the ball and put it into touch. This gave Olney the throw in near Vipers ‘22’. Olney won the ball and attacked setting up their threes to put centre Gavin Robertson in for a try, converted by Hawken to open the scoring to make it 7-0 after eight minutes. Most of the remaining time in the first half was taken up by a fairly even exchange, punctuated by penalties awarded equally to both sides. Vipers line side contingent were cheered when, almost on the stroke of halftime, with Olney defending close to goal they won the ball from a scrum and fed out for a clearance kick to touch. The ball was charged down and bounced into the in goal area where Vipers blindside flanker touched down for a try, which was converted to level things up at the break. Vipers kicked off for the second half and Olney, receiving, kicked to touch near the halfway line. Another penalty in their favour gave Olney the opportunity to gain a line out on the visitor’s ‘22’. Olney won the ball and drove the maul, but were unable to capitalise conceding a scrum to the visitors. Vipers lost the ball and Olney attacked the goal line. To stop the move Vipers gave away a penalty just 5m from their goal line and Hawken made no mistake, easing the home side 10-7 in front. From the restart the home pack counter attacked but the ball ended in touch for a Vipers line out. The visitors won the ball but a knock resulted in a scrum for the home side. Vipers turned the scrum to get the put-in in their favour. They won the ball but lost out knocking on. Olney won the ball from the scrum and attacked through their back line. A kick ahead was overcooked and resulted in a ‘22’ drop out for Vipers. The ball was fielded and passed to Hawken, he passed to ‘fresh legs’ Jon Brice who, in turn, fed John Robinson who carved through the remnants of the Viper’s defence to score under the posts. Hawken added the conversion to make it 17-7. Olney benefited from another penalty following the kick off and kicked to touch on the visitors 10m line. They won the ball and set up the best move in the Olney back line so far. This took play into the Viper’s ‘22’ and was only stopped by the visitors conceding yet another penalty, Viper’s demonstrating their frustration. Olney kicked for a line out on Viper’s 5m line. They won the ball but had to be satisfied with a scrum when a player ran into the referee. A knock on reversed possession and Vipers had put in at a scrum which they won but a poor clearance kick gave Olney possession . Olney used their threes and Hawken looped to draw the defence and put Harry James in for a try in the corner. The try was not converted and Olney stretched their lead to 22-7. Following the restart Vipers progressed and their followers were quietened by a series of three penalties in their favour. Olney were on the back foot and Vipers were making good ground when Brice intercepted a move to pass to Jack Sutton. Hawken was on his shoulder, he passed to Harry James who fed Kane Middleton to score. Hawken converted to wrap up the scores.